ON-SITE routinely provides technical start up support. Whether it’s a single piece of equipment or a large process plant, our team of Mechanical Engineers and Instrument and Controls Specialists work together with the contractor, equipment manufacturer representatives and the owners O&M team in insure a smooth and safe start up. Our team routinely leads start up meetings, coordinates with the equipment manufacturer representatives well in advance of the actual startup date. Our Instrumentation and Controls specialists routinely work with the contractor during loop checks, point to point checks, PLC logic testing, Megger and High Pot testing prior to the commissioning. 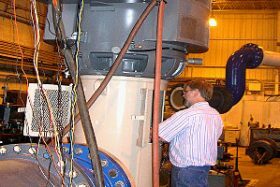 Our Mechanical and Rotating Equipment Engineers monitor the installation process of complex equipment including pumps, motors, VFD’s, generators, hydro turbines, and blowers and fans. Working with the contractor during the installation process to confirm alignment and other critical prestart up inspections is key to a smooth start up. As problems arise our teams can facilitate a quick resolution to reduce schedule impacts. Equipment performance and vibration testing can be completed as the equipment is brought on line. 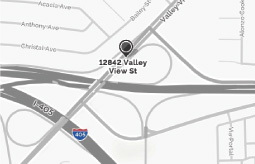 Our team can provide technical support for existing facility problems. Working with the owner and the equipment manufacturer to quickly identify and document the problem, is key to resolving warranty issues. Lake Hodges Projects are an important part of the SDCWA Emergency Storage Project intended to increase the amount of water available within the county for use during emergencies. There are three componenets to these projects which include an underground pipeline, a pump station with an inlet-outlet structure, powerline and substation. The pump station will generate up to 40 Mega Watt capcity by the use of pump turbines capturing energy created when the water runs downhill form the Olivenhain Reservoir. This hydroelectric turbine generator will generate supplemental electricity in the facility and will operate year-round, reducing the Water Authority’s energy costs while supplying surplus power to the region. The construction of this facility consisted of the manufacture of 5,800-feet of 121-inch-diameter pipe, 20 MW transformers, generators, electrical equipment, large diameter valves and unit controls. ON-SITE has provided field support during the installation of mechanical and electrical equipment, and site welding inspection for large diameter pipe. The San Vicente Pump Station Projects are a part of San Diego County Water Authorities Emergency Storage project. The Pump Station will be built to provide facilities for 3 horizontal centrifugal pumps, including 7000 HP motors, 2 variable frequency drives and transformers. 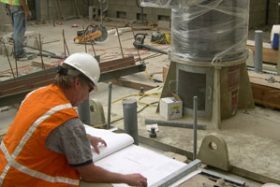 The work being performed consists of the construction of new pump station, surge control facility and inlet outlet structures, installation of fabricated steel pipe and fittings, and related systems, gates and valves, and other appurtenances. ON-SITE provided a Start up Manager as well as Mechanical engineers for the pumps and electrical support for the power and VFD systems. Metropolitan Water Districts OC 88 Project consisted of the fabrication inspection; performance testing and field technical support of (3) each 13,000 GPM, 1500 HP Vertical pumps at locations throughout the United States and Mexico. As an owner representative ON-SITE TECHNICAL SERVICES INC was charged with providing a variety of services in support of the manufacturing and start up processes including, engineering analysis of production problems, which included technical issues associated with start-up, coatings and clarifications to assure compliance with the customer specification requirements. ON-SITE supported the start up of the pump station, vibration analysis, and meetings with the fabricator to resolve problems. The Robert A. Skinner Filtration Plant Expansion Project is one of five filtration plants of the Metropolitan Water District of Southern California, which supplies over 520 million gallons of treated water for 2.5 million people. 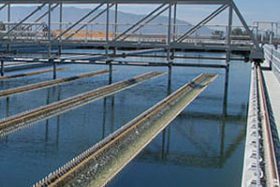 The project consists of the construction of a new Wash Water Reclamation Plant and improvements to Wash water Reclamation Plant No. 2. The work being performed consists of the construction of all new buildings and water treatment structures, wash water reclamation plant, chemical and liquid oxygen plant facilities, cooling water pump station, power sub station and switch gear, yard conduits and piping; modifying plant utilities; connections to existing facilities; testing and commissioning; installation of fabricated steel pipe and fittings, liquid oxygen tanks and vaporizers, ozone generators and related systems, gates and valves, generators and all other appurtenances. ON-SITE provided site inspection and testing during the installation of the electrical equipment and shop fabrication inspection services of the mechanical and electrical equipment and large diameter steel pipe and fittings associated with this project. ON-SITE provided construction inspection services, field technical support, fabrication inspection and engineering support during the performance testing of 2 each 33,000 GPM 700 HP pumps. 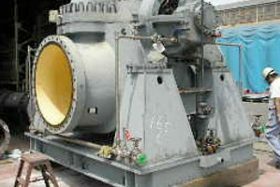 Fabrication inspection of the engineered equipment such as the pumps was completed at locations in the United States and Mexico. SDG & E’s Palomar Power Plant expansion involved the upgrading and replacement of mechanical and electrical equipment throughout the plant. 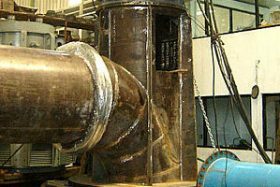 ON-SITE TECHNICAL SERVICES INC provided direct technical support and engineering analysis, fabrication inspection services, supported performance testing and vibration analysis of 3 each 65,000 GPM 1,750 HP Vertical Pumps fabricated in the United States and Mexico. Due to the critical time line associated with the installation of the equipment. ON-SITE provided technical support and failure analysis, on the main Circulating Water Pumps. Additional technical support was provided to Kiewit project engineers in dealing with pump repair and warranty issues, and to meet the contract requirements. Los Angeles Department of Water and Power Palomar Power Plant expansion involved the upgrading and replacement of mechanical and electrical equipment throughout the plant. 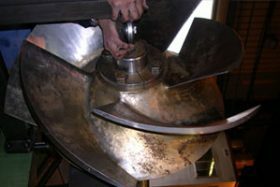 When the installed 42w pumps began making cyclic noise and vibrating during operations, ON-SITE was contacted to perform engineering analysis of the problems associated with 4 each 45,000 GPM, 750 HP Vertical Pumps. 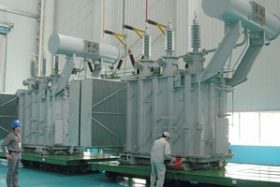 These efforts involved the failure analysis of the pump components, supporting the rebuild efforts and start-up operations of all 4 pump units.